Philipp Münzel has posted another preview teaser from the Ramzzess Boeing 777-200LR for X-Plane 10. Dawson Designs and Virtavia have released the Boeing C-17 Globemaster III for X-Plane 9 and X-Plane 10. - High resolution glass EFIS panels, with double FSX resolution, 6 screens to choose from. - Many custom animations including landing gear, thrust reversers, all doors, 2 position rear ramp, flaps, speed brakes. - High quality animated, folding HUD with 3 de-clutter modes. - Realistic handling including modelling of brown-flap high lift wings. - Detailed and functional Autopilot panel. - Detailed Standby Engine display with preset thrust level buttons. - Functional FMS computer - Plugin enhanced systems for greater system functionality. - Detailed combination Nav/Com/ADF/Transponder radio. - Exterior lighting designed to get the best from HDR in X-Plane 10. - Detailed startup procedure - - Custom warnings and caution panel. - Unique drag-adjust trim gauges. - Toggle hide control column and folding seat arms. - Interactive cargo load dependent on weight. - Cabin Pressure Panel, Windscreen wipers, Adjustable pedals, Functional fire extinguishers. - Interior and exterior cockpit models to maximize frame rate. - 30 page user manual with full checklist. The freeware Prague Ruzyně Intl. Airport (LKPR) scenery 12-30 Edition for FSX and FS2004 has been updated. Jacques Botha has released the freeware Morningstar Airfield (FAMR) for FSX. Available to download at Simviation. The developer of the Outerra terrain engine has posted more Grass Shadowing Previews in the Outerra Development Forum. McPhat Studios has added more livery previews from the upcoming ATR 72-500 for X-Plane on the Facebook Page. Dexter11929 has posted this promo video from the recently released LHSimulations Győr-Pér Intl. Airport (LHPR) scenery. Turbine Sound Studios (TSS) posted another preview video from the upcoming Boeing 767 PW HD Sound Package. Angle of Attack is now offering the free Groundwork Ultra Trial from the PMDG 737NGX Training Program. Majestic Software has posted this 2D Panel Preview Video from the upcoming Bombardier Dash 8 Q400 for FSX. ArezOne-Aviation has released the Lancair Legacy Continental IO550-N SoundSet for FSX. Available at SimMarket. The all-new Computer Pilot - Volume 16 Issue 2 - June/July 2012 is now also available at SimMarket. Flight! Magazine - Issue 08 2012 (german language only) is now available at the Flight! Magazine Website and SimMarket. Flight One Software is currently offering $15.00 off the Super 80 Ultimate Airliners Edition. Valid until August 8th 2012. Carenado has posted the last preview pictures before release of the Cessna C208B Grand Caravan for FS2004. Carenado has posted more preview screenshots from the upcoming Beechcraft B200 Super King Air for FSX. Black Box Simulation has released version 0.54 of the Airbus Xtreme Prologue for FSX. Details at the Product Page. Philipp Münzel has posted FMS Preview Part 4 from the soon to be released Ramzzess Boeing 777-200LR for X-Plane 10. OshkoshSim has published Issue 1 August 2012 of FSReview Magazine. Available to purchase at SimMarket. Taburet has released the Cologne-Bonn Photorealistic scenery for X-Plane 10. Now available to purchase at SimMarket. FS Magazin - Issue 5 2012 (german language only) is now available to purchase at SimMarket. The recently released VertigoStudios Boeing Stearman 'Kaydet' PT-17 for FSX is now also available at SimMarket. The Project Airbus Team has posted another teaser screenshot from the Airbus A330 and A340 aircraft family. Turbine Sound Studios (TSS) posted preview videos from the upcoming Boeing 767 and Airbus A330 HD Sound Packages. Earth Simulations has released Treescapes Vol.6 North Scotland for FSX. Now available to purchase at the ES Store. - Literally Millions of ACCURATELY PLACED trees! - Ordnance Survey data providing Exceptional accuracy! - Extremely dense Autogen tree coverage! - High resolution Tree Textures that represent the UK vegetation. Commercial Level Simulations has released the BAe 146-200 Jetliner for FSX. Available at Just Flight and SimMarket. Carenado has posted more previews from the soon to be released Cessna C208B Grand Caravan for FS2004. Blue Sky Scenery has released the freeware Wind River Range, Part 2: Northeast photo scenery for FSX. The Real New Zealand Auckland City photo scenery for FS2004 is now available as freeware. Download at AVSIM. Philipp Münzel has posted FMS Preview Part 3 from the soon to be released Ramzzess Boeing 777-200LR for X-Plane 10. TK Design has released the freeware Alaska3D OSM scenery for X-Plane 10. Download at X-Plane.org. Taxi2Gate has posted first preview pictures from the upcoming Asunción Paraguay Airport (SGAS) scenery for FSX. 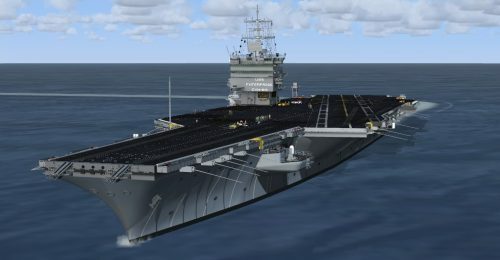 Team SDB has released the USS Enterprise X aircraft carrier for FSX. Now available to purchase at FlightSim Pilot Shop. with unique carrier - details and carrier/aircraft textures for each. - Aircraft servicing vehicles, fire trucks, and deck crew figures with animated "shooter"
- 16 moving carrier tracks (eight locations for each "era") plus a bonus Yankee Station location with the empty 80s carrier. The recently released Alabeo Pitts Special for X-Plane is now also available to purchase at SimMarket. - Main terminal and concourses are made in detail with 3d. - Custom Gmax ground texture from satellite photos will make you feel like being in the real airport. - All major airport buildings included Garuda head office , angkasa pura II building , masjid , cargo building etc..
TropicalSim has released the Rio de Janeiro-Galeão Intl. Airport (SBGL) scenery for FSX and Prepar3D at SimMarket. The developer of the Outerra terrain engine has posted Grass Shadowing Previews in the Outerra Development Forum. NMG Trading is offering Port Elizabeth Airport (FAPE) for FSX as the weekly special. Ends August 5th 2012. Mutley's Hangar has released the July 2012 Hangarcast. Available to download at Mutley's Hangar Podcast.